With the performance of Netflix (NASDAQ:NFLX) yesterday and the market follow through today, the FANG Stock Index is about to hit new all time highs. That is important when considering how much bearishness came to the fore with negative macro news over the last two months. FANG leading tech even with FANG component Facebook's (NASDAQ:FB) negative data privacy headwinds, new highs for FANG is impressive and a bullish sign for markets. We're staying bullish. We see the stock is back in an uptrend over the last few weeks. With all that bad news the stock is only down 4.4% year-to-date. We're leaning on the fact that Mark Zuckerberg has said the news had minimal impact on their business. This year being a mid-term election year in the US does mean there will be more politics aimed at Facebook. Still our numbers are too high so we have no change. Amazon had a big move yesterday. We do think Amazon has been turning into an earnings story but is too expensive for us for now. We'd want to buy Amazon but we'd have to put a 200 PE on this year's numbers to make the upside worth it. We're not ready for that. But if earnings continue to jump that valuation could shrink making it an easier entry. We agree with long term owners of Amazon. The earnings story here is getting stronger each quarter. We have a Buy rating. Google also had a strong move yesterday and is looking like it's back to a solid uptrend. Last quarter Google's earnings story weakened thanks to weaker gross margins. Google for now also dodged being at the center of privacy concerns but they are not immune. We do have a target of $1,400 but we need 45% upside for a Buy Rating so we're not there. You can see how we arrived at our numbers. If you like it longer term we agree but for us we narrow our Buys to something that has 45% upside potential or more over a 12 month period. No macro news is good macro news allowing the stocks to move back up. 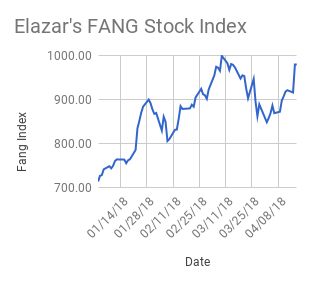 The FANG Stock Index is on its way to hitting new all time highs while the market is still concerned about macro issues. We take that as a bullish sign that despite bad news the leading stocks are showing strength. All investments have many risks and can lose principal in the short and long term. The information provided is for information purposes only and can be wrong. By reading this you agree, understand and accept that you take upon yourself all responsibility for all of your investment decisions and to do your own work and hold Elazar Advisors, LLC, and their related parties harmless. Model portfolio trades and positions are hypothetical to be used for directional analysis and ratings purposes. Elazar and its employees do not take individual stock positions to avoid front running and other potential customer related issues. Elazar does take macro positions for clients where directions can change regularly.